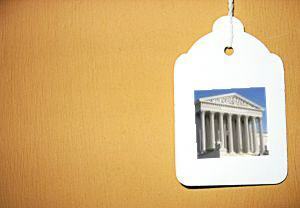 Aplia Econ Blog: News for Economics Students: Should Resale Price Maintenance Be Legal? Should Resale Price Maintenance Be Legal? If economists generally agree about anything, it is that competitively set prices maximize efficiency and welfare. On the other hand, another central tenet of economics is that efficiency may be achieved by allowing individuals and firms to enter into contracts with one another: for example, Ronald Coase famously showed that problems involving externalities could be solved if all affected parties could negotiate with one another. However, not all contracts are legal. Most prominently, laws like the Sherman Antitrust Act place strict prohibitions on the kinds of contracts firms can write with one another. For example, airlines cannot agree with one another to keep prices high; that would be illegal collusion. Furthermore, manufacturers cannot require retailers to sell their products at a minimum price—a practice called "resale price maintenance." ...the mere fact that [resale price maintenance] would increase prices doesn't prove anything. If in fact it's giving the consumer a choice of more service at a somewhat higher price, that would enhance consumer welfare, so long as there are competitive products at a lower price. Recall that consumer surplus is defined by economists as the difference between what a consumer is willing to pay and the price they actually pay. One way of summarizing Justice Scalia's argument is that there are two variables in determining consumer surplus: the price, and the value of the service. If resale price maintenance encourages retail outlets to compete on service, the value to consumers may increase, and may increase more than the increase in price. The key to this argument is the phrase "so long as there are competitive products at a lower price." In the case of the leather-goods market, it's true that there are lots of producers of leather goods. Therefore, high prices can only be sustained if there is an accompanying increase in quality of service. 1. Resale price maintenance agreements would seem to be good for retailers, as they allow them to sell at a price above marginal cost. Yet the plaintiff in this lawsuit was in fact the retailer, Kay's Kloset, who wanted to sell the leather goods made by Leegin Creative Leather Products at a discount. Who do you think benefits more from resale price maintenance agreements, manufacturers or retailers? Why? [A manufacturer] may want its retailers to provide customers a pleasant showroom and a knowledgeable sales force. Yet, without resale price maintenance, some customers would take advantage of one store's service to learn about [a product's] features and then buy the item at a discount retailer that does not provide this service. Do you think that resale price maintenance solves an important free-rider problem, as Mankiw suggests? Why or why not? 3. Resale price maintenance contracts are just one example of a kind of economic contract that is illegal. Philosophically, one might argue that it is illegal precisely because it limits the kind of contracts that one of the parties entering the contract can sign. For example, a resale price maintenance agreement that fixes the price of a leather jacket at $200 essentially stipulates that the retailer cannot enter into a contract with a buyer at which the jacket is sold for less than $200. Can you think of other contracts that people enter into that inhibit their ability to act freely in the future? Are they useful? Are they illegal? Should they be? 4. Some things are "per se" illegal under the Sherman Act, while for others, the "rule of reason" applies—that is, courts judge how anticompetitive they are on a case-by-case basis. If the leather-goods manufacturer is successful in this petition, resale price maintenance contracts would shift from the former category to the latter. Is that appropriate? How would you apply the "rule of reason" to a resale price maintenance case? (How) Are Men and Women Different? Should the Music Industry Abandon DRM? How Sustainable Are High Margins?